Active thermal management is vital in a number of medical device applications including patient core temperature management, skin cooling, medical device cooling, and laboratory equipment cooling. 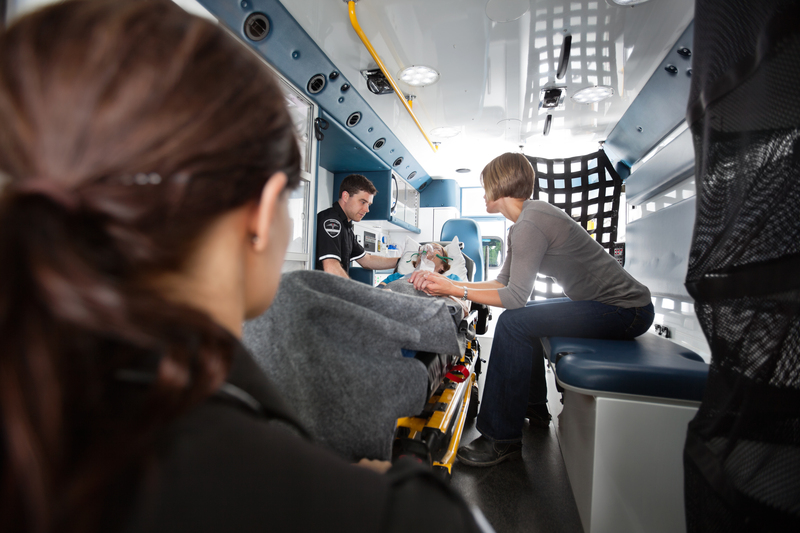 These applications include initial emergency medical services, in-hospital patient thermal management, a range of procedures that take place in doctor’s offices, and in laboratory equipment. To meet this growing need, medical device designers need highly efficient and compact cooling systems that can be integrated into their systems, often with the option of battery power for mobility. Cooling medical devices presents unique challenges to the engineers responsible for the thermal management designs in these systems. To gain acceptance in a medical setting, these devices must be compact, quiet, effective, and often must be placed inside the chassis of the medical system to keep tangled wires and hoses off the floor and out of the way of practitioners. These required features conspire to make thermal management in these applications challenging. A variety of solutions including simple fans, liquid cooling, or compact refrigeration systems are being used to meet these challenges. 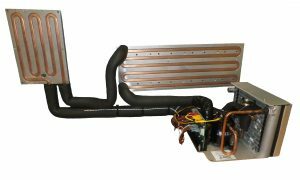 This article provides a review of some of the most interesting thermal cooling applications. A variety of cooling methods will be reviewed including passive techniques such as direct, air, and liquid loop. Part 2, which will appear in a future issue, will examine active cooling methods that provide additional cooling for direct, air, and liquid cooling using vapor compression, as well as thermoelectric methods. Mobile, battery-operated (12 VDC) patient thermal management to reduce core body temperature. Patient thermal management applications include therapies where the patient core temperature is altered to achieve a more optimum outcome. To attain a change in patient core temperature, heat must be removed from the body in sufficient quantity to overcome the body’s heat production with sufficient control to remain safe and effective while not interfering with other procedures that are taking place. There are many methods of removing heat at the patient interface that have been researched, but the least invasive of these involve pads that have embedded water channels of various designs that are placed in good contact with the patient’s skin. All systems of this type require a cooling system. Most often, a chiller that provides a recirculating stream of cooled liquid is used. Thermal management for neonatal encephalopathy is referred to as brain hypothermia. This process cools a baby to around 33 °C for three days after birth in cases where there has been a deprivation of oxygen to a newborn that lasted long enough during the birthing process to cause physical harm, usually to the brain. Brain hypothermia has shown to be the only medical intervention that reduces brain damage, improving the baby’s chance of survival with reduced disability. In cases of targeted thermal management during the post-cardiac arrest period, it has been proven that hypothermia is helpful because it can “restrict the area of injury, improve epicardial reflow, decrease myocardial metabolic demand, and conserve intracellular high-energy phosphate stores” (see “Further Reading”). Fig. 1 – Schematic of a hypothermia and skin cooling system. In localized skin cooling, cooling the core temperature of the patient is undesirable; it is preferred that the skin be cooled locally to achieve a variety of desired effects. 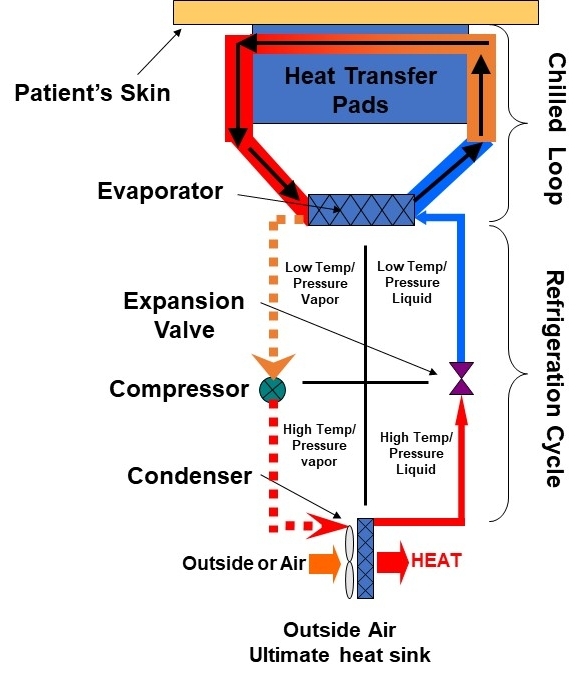 In a manner similar to that used in hypothermia treatments, a liquid chiller and cooling pads are often used to achieve the desired heat transfer. Skin cooling has been applied with good effect in cancer patients (see Figure 1). It is widely known that hair loss is a side effect of chemotherapy treatments and can have a traumatic impact on patient emotional well-being. By cooling the scalp both during and after chemotherapy treatment, hair loss can be reduced. By placing cold scalp caps on the patient, the vessels in the scalp are cooled, and the capillaries that carry the chemotherapy vasoconstrict. This vaso-constriction reduces the blood flow to the area, and the low temperature reduces the reaction of the chemotherapy treatments with the hair follicles. The end result is that the damage to hair follicles is significantly reduced, mitigating or reducing hair loss. Some studies have shown that thermal therapy is effective for stroke patients (focused on upper limb functional recovery). Known as thermal stimulation, it has shown to enhance sensory and motor function recovery. The key seems to be the activation of motor and sensory function at the same time. Thermal stimulation consists of alternate cycles of heating and cooling. Another class of treatments that benefit or require skin cooling are laser aesthetic applications. Laser procedures such as hair or tattoo removal involve the direct interaction of the laser with the skin. While the lasers are tuned to minimize the pain, the energy absorbed can be painful. Skin cooling is used to mitigate this pain and enable longer treatment sessions than would otherwise be possible. This class of cooling applications includes medical devices that are used with patients where the system, not the patient, requires the cooling. 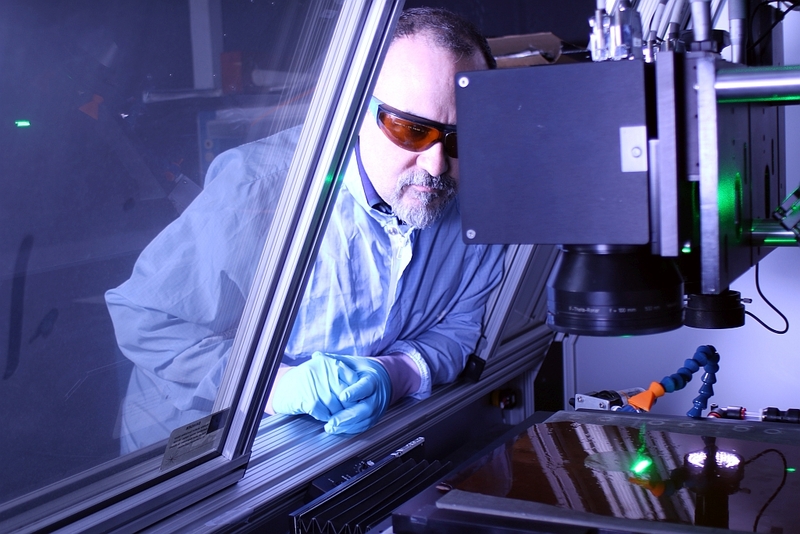 These devices can include lasers, diodes, or electronics that are particularly sensitive to overheating. 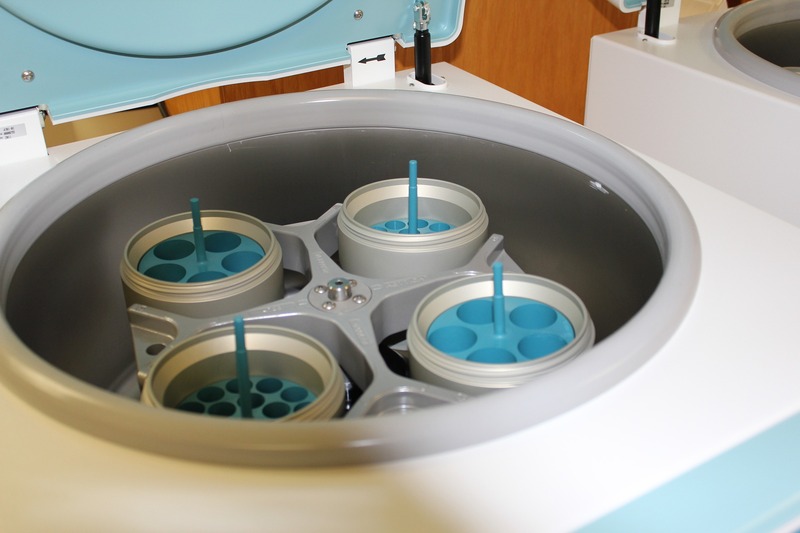 Refrigerated centrifuge (−20° to 40 °C), for PCR, DNA, and RNA, and analysis. PCR is the preferred scientific method for generating a sufficient amount of identical genetic material for study and analysis. The process uses repeated heating and cooling cycles. During the thermal cycles, DNA primers bind to the target DNA sequence, making it possible to produce millions of copies of a DNA sequence in a test tube in just a few hours (see “Further Reading”). Thermal management is a critical piece in the proper storage of blood products and other biomedical supplies. Lab cooling equipment is needed to keep reagents at a definite temperature to remain stable. Many lab products are extremely sensitive to certain high or low temperatures. Many types of lab cooling products are used, including blood bank refrigerators, close loop water chillers, hermetically sealed compressors, and lab refrigerators. Although developments made in lab equipment heating and cooling processes are not often highlighted, they remain a critical factor to the success of clinical laboratories. New innovations in laboratory systems include wireless monitoring, remote sensors, dual convection technology and advanced microprocessor controls. Today, it is agreed that wireless monitoring systems are indispensable for cooling of laboratory equipment. Scientists and engineers agree that having reliable cold storage with the latest technology protects research and ensures more reliable results. While cooling medical devices presents unique challenges for the design of thermal management into them, a variety of solutions are available to ensure that they meet requirements — whether the need is to minimize noise or to keep tangled wires and hoses contained. Everything from simple fans or liquid cooling to compact refrigeration systems can help address these challenges.